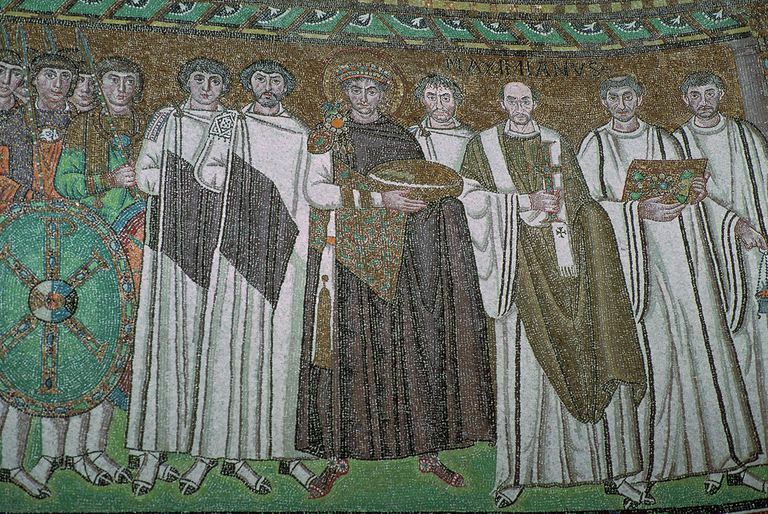 Mosaic of Justinian I (c. 482 14 November 565), and his court in San Vitale, 6th century. Justinian, or Flavius Petrus Sabbatius Justinianus, was arguably the most important ruler of the Eastern Roman Empire. Considered by some scholars to be the last great Roman emperor and the first great Byzantine emperor, Justinian fought to reclaim Roman territory and left a lasting impact on architecture and law. His relationship with his wife, Empress Theodora, would play an essential role in the course of his reign. Justinian, whose given name was Petrus Sabbatius, was born in 483 C.E. to peasants in the Roman province of Illyria. He may have still been in his teens when he came to Constantinople. There, under the sponsorship of his mother's brother, Justin, Petrus acquired a superior education. However, thanks to his Latin background, he always spoke Greek with a notable accent. At this time, Justin was a highly-ranked military commander, and Petrus was his favorite nephew. The younger man climbed the social ladder with a hand up from the older, and he held several important offices. In time, the childless Justin officially adopted Petrus, who took the name "Justinianus" in his honor. In 518, Justin became Emperor. Three years later, Justinian became a consul. Sometime before the year 523, Justinian met the actress Theodora. If The Secret History by Procopius is to be believed, Theodora was a courtesan as well as an actress, and her public performances bordered on the pornographic. Later authors defended Theodora, claiming that she had undergone a religious awakening and that she found ordinary work as a wool spinner to support herself honestly. No one knows precisely how Justinian met Theodora, but he appears to have fallen hard for her. She was not only beautiful, but she was also shrewd and able to appeal to Justinian on an intellectual level. She was also known for her passionate interest in religion; she had become a Monophysite, and Justinian may have taken a measure of tolerance from her plight. They also shared humble beginnings and were somewhat apart from Byzantine nobility. Justinian made Theodora a patrician, and in 525 — the same year that he received the title of Caesar — he made her his wife. Throughout his life, Justinian would rely on Theodora for support, inspiration, and guidance. Justinian owed much to his uncle, but Justin was well-repaid by his nephew. He had made his way to the throne through his skill, and he had governed through his strengths; but through much of his reign, Justin enjoyed the advice and allegiance of Justinian. This was especially true as the emperor's reign drew to a close. In April of 527, Justinian was crowned co-emperor. At this time, Theodora was crowned Augusta. The two men would share the title for only four months before Justin passed away in August of that same year. Justinian was an idealist and a man of great ambition. He believed he could restore the empire to its former glory, both in terms of the territory it encompassed and the achievements made under its aegis. He wanted to reform the government, which had long suffered from corruption, and clear up the legal system, which was heavy with centuries of legislation and outmoded laws. He had great concern for religious righteousness and wanted persecutions against heretics and orthodox Christians alike to end. Justinian also appears to have had a sincere desire to improve the lot of all citizens of the empire. When his reign as sole emperor began, Justinian had many different issues to deal with, all in the space of a few years. One of the very first things Justinian attended to was a reorganization of Roman, now Byzantine, Law. He appointed a commission to begin the first book of what was to be a remarkably extensive and thorough legal code. It would come to be known as the Codex Justinianus (the Code of Justinian). Although the Codex would contain new laws, it was primarily a compilation and clarification of centuries of existing law, and it would become one of the most influential sources in western legal history. Justinian then set about instituting governmental reforms. The officials he appointed were at times too enthusiastic in rooting out long-entrenched corruption, and the well-connected targets of their reform did not go easily. Riots began to break out, culminating in the most famous Nika Revolt of 532. But thanks to the efforts of Justinian's able general Belisarius, the riot was ultimately put down; and thanks to the support of Empress Theodora, Justinian showed the kind of backbone that helped solidify his reputation as a courageous leader. Though he may not have been loved, he was respected. After the revolt, Justinian took the opportunity to conduct a massive construction project that would add to his prestige and make Constantinople an impressive city for centuries to come. This included the rebuilding of the marvelous cathedral, the Hagia Sophia. The building program was not restricted to the capital city, but extended throughout the empire, and included the construction of aqueducts and bridges, orphanages and hostels, monasteries and churches; and it encompassed the restoration of entire towns destroyed by earthquakes (an unfortunately all-too-frequent occurrence). In 542, the empire was struck by a devastating epidemic that would later be known as Justinian's Plague or the Sixth-Century Plague. According to Procopius, the emperor himself succumbed to the disease, but fortunately, he recovered. When his reign began, Justinian's troops were fighting Persian forces along the Euphrates. Although the considerable success of his generals (Belisarius in particular) would allow the Byzantines to conclude equitable and peaceful agreements, war with the Persians would flare up repeatedly through most of Justinian's reign. In 533, the intermittent mistreatment of Catholics by the Arian Vandals in Africa came to a disturbing head when the Catholic king of the Vandals, Hilderic, was thrown into prison by his Arian cousin, who took his throne. This gave Justinian an excuse to attack the Vandal kingdom in North Africa, and once again his general Belisarius served him well. When the Byzantines were through with them, the Vandals no longer posed a serious threat, and North Africa became part of the Byzantine Empire. It was Justinian's view that the western empire had been lost through "indolence," and he believed it his duty to re-acquire territory in Italy — especially Rome — as well as other lands that had once been part of the Roman Empire. The Italian campaign lasted well over a decade, and thanks to Belisarius and Narses, the peninsula ultimately came under Byzantine control — but at a terrible cost. Most of Italy was devastated by the wars, and a few short years after Justinian's death, invading Lombards were able to capture large portions of the Italian peninsula. Justinian's forces were far less successful in the Balkans. There, bands of Barbarians continually raided Byzantine territory, and though occasionally repulsed by imperial troops, ultimately, Slavs and Bulgars invaded and settled within the borders of the Eastern Roman Empire. Emperors of Eastern Rome usually took a direct interest in ecclesiastical matters and often played a significant role in the direction of the Church. Justinian saw his responsibilities as emperor in this vein. He forbade pagans and heretics from teaching, and he closed the famous Academy for being pagan and not, as was often charged, as an act against classical learning and philosophy. Though an adherent to Orthodoxy himself, Justinian recognized that much of Egypt and Syria followed the Monophysite form of Christianity, which had been branded a heresy. Theodora's support of the Monophysites undoubtedly influenced him, at least in part, to attempt to strike a compromise. His efforts did not go well. He tried to force western bishops to work with the Monophysites and even held Pope Vigilius in Constantinople for a time. The result was a break with the papacy that lasted until 610 C.E. After the death of Theodora in 548, Justinian showed a marked decline in activity and appeared to withdraw from public matters. He became deeply concerned with theological issues, and at one point even went so far as to take a heretical stand, issuing in 564 an edict declaring that the physical body of Christ was incorruptible and that it only appeared to suffer. This was immediately met with protests and refusals to follow the edict, but the issue was resolved when Justinian died suddenly on the night of November 14/15, 565. His nephew, Justin II succeeded Justinian. For nearly 40 years, Justinian guided a burgeoning, dynamic civilization through some of its most turbulent times. Although much of the territory acquired during his reign was lost after his death, the infrastructure he succeeded in creating through his building program would remain. And while both his foreign expansion endeavors and his domestic construction project would leave the empire in financial difficulty, his successor would remedy that without too much trouble. Justinian's reorganization of the administrative system would last some time, and his contribution to legal history would be even more far-reaching. After his death, and after the death of the writer Procopius (a highly respected source for Byzantine history), a scandalous exposé was published known to us as The Secret History. Detailing an imperial court rife with corruption and depravity, the work — which most scholars believe was indeed written by Procopius, as it was claimed — attacks both Justinian and Theodora as greedy, debauched and unscrupulous. While most scholars acknowledge the authorship of Procopius, the content of The Secret History remains controversial; and over the centuries, while it tarred the reputation of Theodora pretty badly, it has largely failed to reduce the stature of Emperor Justinian. He remains one of the most impressive and important emperors in Byzantine history.